The launch of the McCafé Horchata Frappé from McDonald’s came just in time for the summer festival season here in Chicago. 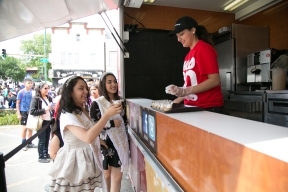 For many festival attendees the Horchata Frappé came free these past two weeks at the Back of the Yard’s Festival and the Puerto Rican Festival in Humboldt Park courtesy of the McDonald’s Hispanic Owner Operator Association (MHOA). They really enjoyed the cool and creamy frappé inspired by the traditional, sweet Mexican Horchata and lucky for Chicagoans; we are the only Hispanic market currently selling it in all McDonald’s.